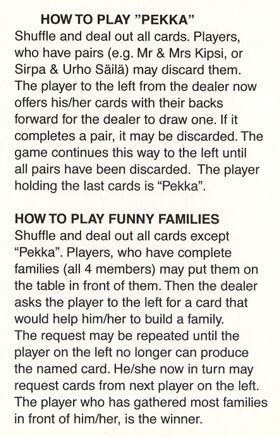 the traditional Finnish children's card game titled Pekka-game or Funny Families. The Pekka-game consists of family members of four, illustrating the stereotypes of Caucasian Finns with various occupations such as the Baker, the Skipper, the Tailor, the Fisherman, the Farmer, the Pilot, the Banker, the Photographer, each with their wife, daughter and son. 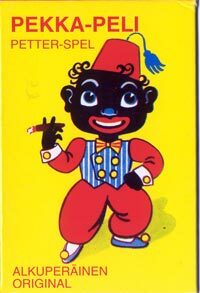 Pekka, an additional card in the set, is an ethically-incorrect gollywog look-alike card, embodying the caricature of foreign heritage without a status or family structure. The object of the game is to collect the sets of family members and avoid getting the loser-card Pekka. Right: the front of the box shows the Pekka character. The captions are in Finnish and Swedish. Above: Pekka-Peli card game, produced by Peliko/Martinex Oy, Raisio, Finland. The card names are in Finnish at the top and in Swedish at the bottom of each card. 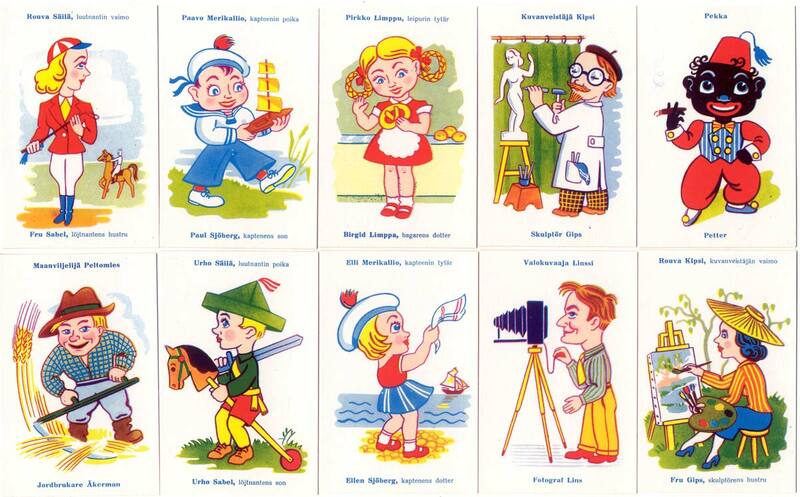 Traditional card games like these have been played by Finnish children for decades. The game is here in its original form. Finnish cards have a relatively short history, presumably because the country only finally broke loose from Russian influence in 1920. Right: the rules for two different games are included in the set. See also: Happy Families Reshuffle by Reetta Hiltunen Noddy Happy Families Jaques' Illustrated Proverbs Jaques' Happy Families Black Peter Walt Disney Cromy Card Games Zoo Comics.